Star Trek: Discovery is set in Trek’s past, but so far we’ve been treated to a galaxy of new technology, ships, and alien races. In our new weekly feature, “Who are the People on your Crew Roster?”, we’ll examine the new faces seen on Federation and other alien ships. Race: Jeezus! What is that?! Actor: Seriously! God . . . wow. OK.
Rank: Is it, like . . . a mammal? Or . . . yikes . . . Position: *long exhale* I . . . I don’t . . . boy . 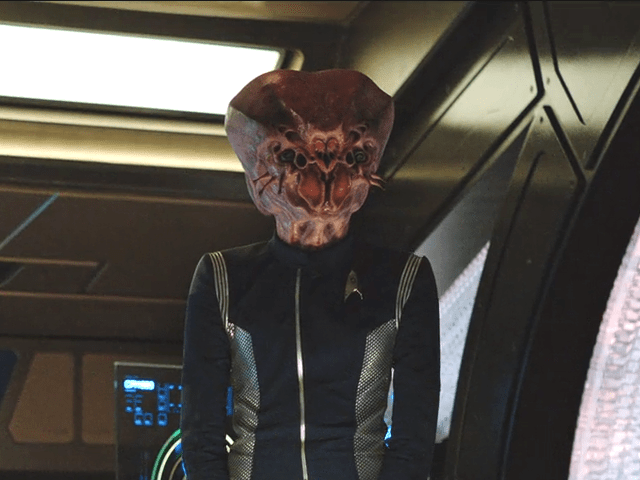 . . wow, OK.
Osnullus (rank unknown) is an officer aboard the USS Discovery. It is currently unknown whether “Osnullus” is the name of a species or the name of the character. The species’s head, however, looks like a fly and a spider were caught in a transporter accident. No word on whether Osnullus finds themselves delicious as a result of this. Very little information is available about Osnullus, but it’s a given that you won’t see him/her/them on a spacewalk any time soon, because you are *not* getting a helmet over that mother. It’s a really elaborate, crazy design and it’s pretty cool. I’m ready for a fly-headed main character.